Personalized investment solutions with a dedicated financial advisor. Legacy Wealth Management is a Financial Consulting Firm, offering the experience and advice of Investment Professionals that will help you understand the opportunities and potential rewards available when you take a proactive approach to your personal financial situation. We created this website to help you gain a better understanding of the financial concepts behind Insurance, Investing, Retirement Planning, and Wealth Preservation. More importantly, we hope you will see the value of working with skilled professionals to pursue your financial goals. Please take advantage of this resource and visit us often, as we are frequently updating our information. 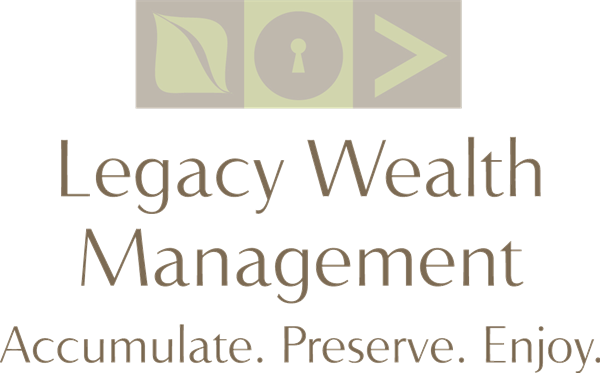 Our mission at Legacy Wealth Management is to strive to earn an unparalleled reputation as an advisor to our clients by helping them to achieve and preserve financial integrity. We pledge our knowledge, our resources, and our dedication to integrity, in all that we do. We have equipped our business with some of the most advanced technology available in the financial service industry, allowing us to give our clients personalized asset analysis, allocation and investment service. Thank-you for visiting our virtual office, we look forward to helping you pursue your financial goals! There's no need to worry about your data with WealthVision's state-of-the-art security.